The New York Times Sunday Review article September 20, 2015, A Toxic Work World reports many Americans are facing stress-inducing competition, and twelve to sixteen hour workdays at all levels of the socioeconomic scale. At the same time there is a swing from highly competitive workplaces, where performance is measured by total hours worked, toward a collaborative, results orientation that was unheard of in the days of my father. Some believe the new trend has evolved from the arrival of the Internet, some say women breaking out of their stereotyped roles, or disdain for the gridlock in the United States Congress. One of the change leaders is Patricia McLagan, founder of McLagan International, (http://mclaganint.com/), who in the late 80's began a movement to focus on customer satisfaction rather than company profits. But no matter how these changes started, they have arrived. My father had taught me how to wear his tough, show-no-emotions, masculine breastplate. However, men today who don't want to collaborate, or don't know how, are facing an uphill battle. Many younger adults, talking and texting with anyone anytime, now embrace it. Collaboration thrives on building relationships, and Brené Brown, who researches human behavior, found successful people best build relationships by being vulnerable. But during my strongly competitive corporate days, hierarchical leaders used an employee's known vulnerabilities to pass over their next promotion. Today, as both gender's roles continue to expand, some companies are touting teamwork above individual competition. And women are not the only gender to relate well with others, or, become nurses, cook, do housework and support their spouses' pursuit of their dreams. A man I know meets with a small group of men with different political affiliations who gather outside work to discuss their differences in a civil manner. In Houston, A Walking Tour of Male Spirituality has begun with its first commitment to practice building relationships in a safe and trustworthy environment, in which every man freely directs his own life and is worthy of being heard. 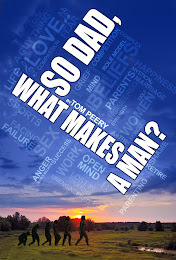 It poses questions about life from So Dad, What Makes a Man; A Narrative on the Male Identity. To be clear, my stories are not all models to be imitated. My twenty-five year career as a "workaholic," highly competitive with every colleague , left me little family time and no time to learn about myself. After I retired I had no close relationships from work but I began to learn more about myself and relating to others --often quite by accident--that transformed me. In both the ten-session A Walking Tour and the book So Dad What Makes a Man? the terms "spirituality" and "spiritual presence" refer to one's personal relationship with God. A Walking Tour of Male Spirituality is an invitation to practice relating better with your spouse, a friend or in a group. If you already belong to a men's group, it makes for good discussions.